now appear more vivid and detailed. just unleash your creativity in the most convenient and modern way. into an awesome animation. This is exactly how cartoon is made, and it is not only logical. Online Pixel Gallery: As a true fan of pixel art, share your awesome designs with the rest of the world, where others can download your inspiring works. 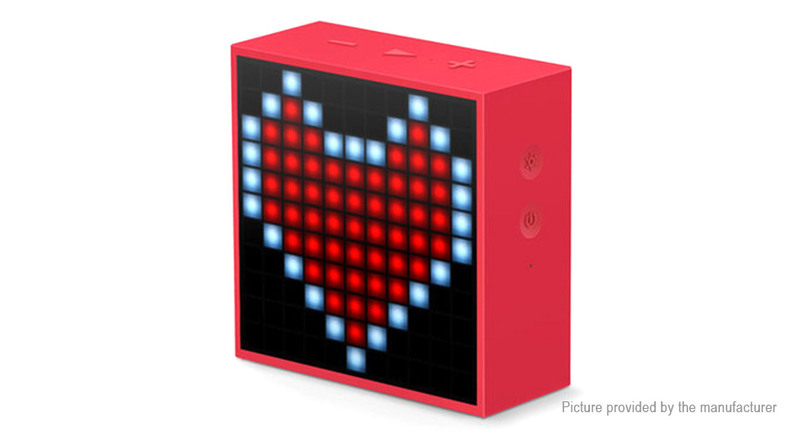 The dancing lights: Following the rhythms of your music, the Timebox Mini lights will dance to the beats. We also have some great lighting effects, where you can further enhance your audio experience with the vibrant patterns. Don’t stop the beats: Everyone’s a DJ with the Timebox-Mini. Play your favorite beat, and start jamming with the built-in sound effects. Mood lighting: The Timebox Mini has the similar luminosity as a 3W night light, where you can select the perfect lighting that suit your mood. Pick the color and brightness, play the favorite beat; the night is young. Sleep Aid: With both visual and audio stimulation, Timebox-Mini included 22 professional sleep-aid tracks that help you fall asleep faster. Pixel Chat: Unique chat system that only available between you and your invited buddy, where you can surprise him/her with a pixel design displayed on the Timebox Mini. You can send a pixel emoji/pixel design regardless your location; it will ‘magically’ appear on his/her Timebox Mini. Weather Report: Online weather report for your area, Timebox Mini is your little weather reporter on the clock. Weather report based on your GPS location. Time Planner: Studying for a final, working out at home, or keeping track of a baby’s dietary schedule; you can add/customize the planner on the Timebox Mini to better assist you. Voice Memo: Leave a voice message on the Timebox Mini, it’s your personal reminder or a ‘fridge notepad’ for your family. Stopwatch: Timebox Mini can help you to count the time, while you concentrating on your work. Date reminder: Set a customized reminder for the important days. Stay updated: Every Timebox Mini will continue to evolve throughout the software updates, where we will fix bugs send updates, and release new functions. This is not the boring average speaker; this is a tiny entertainment center that continues to evolve.